Sailing to the atolls in the Tuamotus is like going to a Broadway play. Show up late and you can't get in. Show up early and you will get in, but you must wait to be seated. Our forecasts promised three days of sailing in 15 knot trade winds on an easy broad reach with light seas. Piece of cake! That's just what we enjoyed for the whole first day and it was a pure delight. In fact we were going so fast, we worried about showing up way too early. But for now things were just too good to get really worked up about an arrival still over two days away. Besides, we had more important things to concern ourselves with. 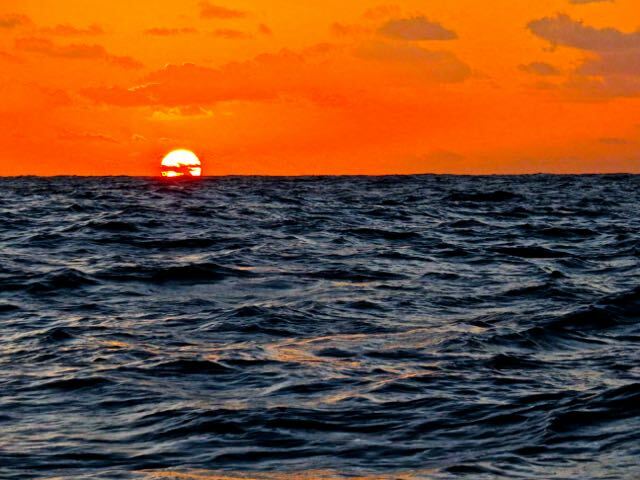 Like another beautiful tropical sunset. But by midnight, we had squalls around us that changed everything. Squalls can produce heavy winds, but it really depends on where you are in relation to the cloud. In our case, we were on the back side of the squall where the wind dropped to nothing. So we motored. For seven hours. 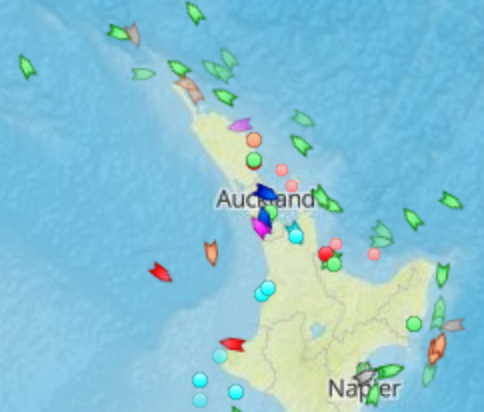 It seems our squall was traveling to Kauehi along with Moonshadow. Now it looked like we were going to be late for Act I. The second day we finally got some wind, but soon, it backed from East to East-Northeast, then to Northeast, then to North-Northeast. Now the wind was at our back, and that isn't as good as the well intentioned saying "May the Wind Always Be At Your Back" sounds. So we found ourselves motoring again. This time for about 15 hours. Oddly, we later learned that our friends aboard Speakeasy, fifty miles behind Moonshadow, were finding themselves on the windy side of their own squalls and using them to make good time. "Hey, this beer isn't very cold!" Squalls, schmalls, those are words that put the fear of God into any sailor's heart. Somehow boat refrigerators know. They can go months without a hiccup, but whenever you fill the fridge with food for a long passage, just like clockwork the damn thing will go out on strike. Sure enough, Deb reported those dreaded words and we thought we were doomed to throwing out a whole freezer full of expensive Costco steaks. We know the drill though. Deb started making bags of ice while John went in search of some some easy "Ah HA!" discovery that would put things right. All the usual suspects turned out not to have a role in the refer's hissy fit, but soon McGiver found the smoking gun. Literally. 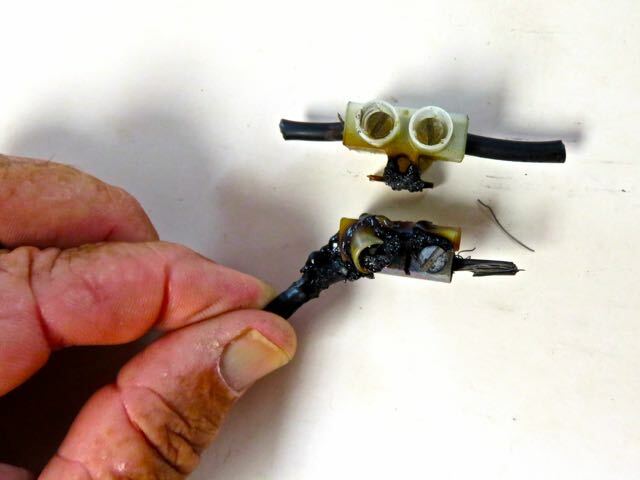 We still don't know why this type of connection was used in the first place, or why it worked for so long, then burned up, but soon the bad stuff was cut away and replaced and we were back to cooling beer. And back to thinking about all that other scary stuff like reefs and squalls. The third morning we had clearing sky ahead and ugly black weather behind us. This time the weather slowly receded behind us and our wind clocked around back to East so we found ourselves reaching at nine knots with the GPS estimating our arrival just about on time or a tad early. This new wind and terrific sailing lasted all day and into the evening, by which time it looked like we were going to arrive several hours early so just after dinner we put a double reef in the main to slow down. Reef, schmeef. We showed up early. Five hours early. We had to kill time. Our waiting room was the nine mile wide channel between Kauehi and Raraka, the atoll to the south. It was 0300 and it was pitch black. The moon had set and there was a heavy blanket of thick wet clouds. You had to stare into the blackness for a long while just to make out the horizon. With atolls less than five miles away both port and starboard, we hove-to. "Heaving-to" is a maneuver with the jib or staysail sheeted to windward and the wheel hard over which effectively results in the boat being parked with the sails up. The boat can't tack because the jib is backwinded; can't bear away because the wheel is hard over; and can't proceed forward because the backwinded jib is like holding your foot on the breaks. When we heave-to in the open ocean, for all practical purposes Moonshadow is stopped, but the reality is you are never really stopped on a boat at sea. Soon the chart-plotter confirmed that we were slowly getting closer to Raraka. Knowing that out there somewhere fairly close is a reef with crashing waves that you won't see till you are in the surf makes the hair on your neck stand on end. After an hour and a half, we tacked and hove-to again so we'd drift back to the center of the channel. Finally in the growing light we could make out palm trees growing on the motus (small sand islands) on the coral reefs both port and starboard. When daylight was finally upon us we noticed some very dark clouds in the Eastern sky to windward of our position in the channel. 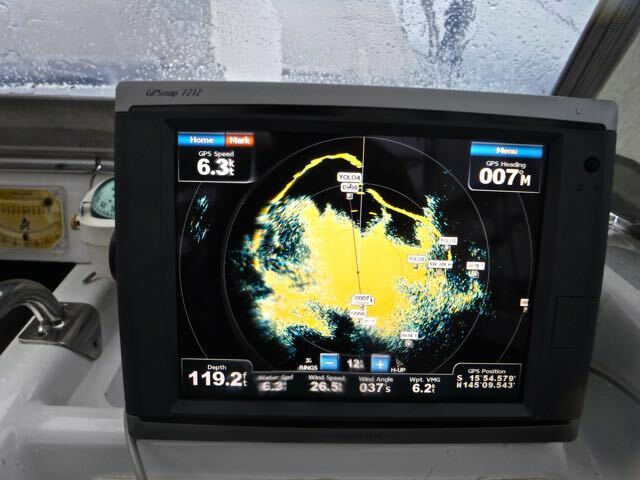 As we discussed when we should begin motoring to the lagoon entrance, still about 10 miles off, we found ourselves in driving rain, 37 knots of wind, and very poor visibility. No longer able to see the atolls, we finally rolled up the staysail and motored with the double reefed main over to the Kauehi lagoon pass, watching our radar and chart plotter. This squall followed Moonshadow for the next three hours all the way to the pass, through the pass and into the lagoon and finally eight miles or so across the lagoon to our anchorage. If squalls were named by the weather service like big storms, it would be called "Moonshadow"
For all the worrying about arriving at just the right time, navigating the pass was really no big deal. By comparing our GPS speed over the bottom with our water speed, we couldn't recognize any current, and saw no disturbed water. For what was advertised as an easy three day sail, this turned out to be more of a trial. So with no sleep for 24 hours, when we finally had the anchor down it was off to bed. In the flat, calm waters of the lagoon we spent the afternoon listening to rain showers pelt the deck overhead, and dozing on a boat that was finally still for the first time since leaving the marina in La Cruz, Mexico. WOW!! 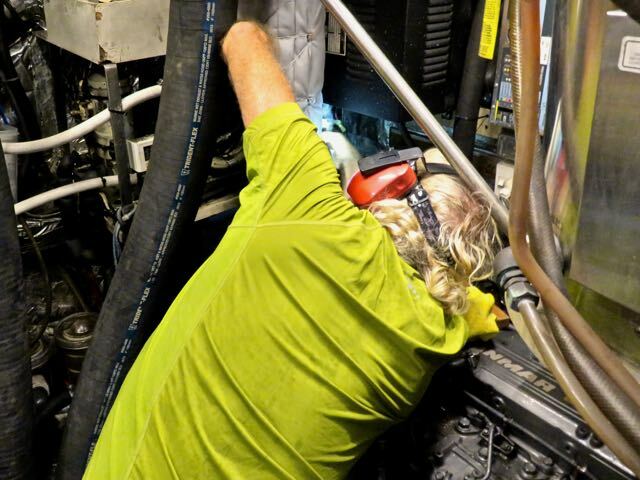 That sailing stuff isn't for the faint of heart! I've been thinking about you lots and lots lately and am so glad you're doing fine! Rest and relax and pat yourself on the back for a job well done! Love youse twos!! So rich the reward of challenges met and adventure conquered!